Milk glass is a term, used mainly by collectors, for typically machine-made opaque white glass dating to the late nineteenth century or later. 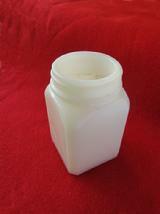 Archaeologists most often encounter milk glass in the form of canning jar lid liners (a) or cold cream jars (b). 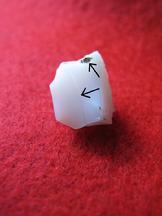 In some cases shards of opaque white glass are recovered on sites and are too small to be easily identified. In these cases it is important to consider all of the possibilities. CCR archaeologists were presented with this problem on a site in eastern North Carolina. 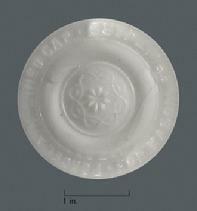 Artifacts from the site were predominately indicative of an eighteenth-century occupation, but the presence of a seeming milk glass suggested the possibility of a broader date range. A close inspection of the single piece of opaque white glass measuring a half of an inch across showed the glass was not homogenously white. There were colorless streaks and other minute variations and impurities that would indicate it was hand-blown glass (c). Being hand blown, this small shard of glass likely dates to the same period as the rest of the artifacts recovered from the site. There was a period in the middle of the eighteenth century when opaque white glass was fashionable and being produced throughout Western Europe. Production centers in Bohemia and England turned out opaque white table glass with enameled polychrome decorated exteriors in traditional European forms (d) as well as ones similar to imported Chinese porcelain (e). Production in England was centered in Bristol starting in the mid-1740s and was at its peak through the 1760s (Noel Hume 1970). Opaque white glass continued to be produced into the nineteenth century, but did not become common until the advent of mechanized glass blowing in the 1890s.